China has long been perceived as a “nation of copycats,” where the shanzhai mentality reigned supreme, but, while pirating still goes on there, China has already moved on to the next phase of its development. The same has happened with WeChat. What started out as a Chinese copy of Whatsapp has evolved into something much bigger and far more powerful. WeChat started out as a very basic messaging app. Friends texting friends. That’s about it. Then it added phone calling and video calling capabilities. Then, it began to expand into areas that had previously not been associated with simple messaging apps. Pages for photos, linking and liking, commenting and updates were now part of the mix. It was turning into more of a social network. Then, it added functions like taxi hailing and food delivery. Ecommerce and fund transfers weren’t far behind. People could send virtual red envelopes with money, the same as the ones given in real life on special occasions, via WeChat. And millions and millions of people did just that. The app became ubiquitous. WeChat pay meant people could also settle restaurant bills and pay for groceries with WeChat. Now, people can do everything from booking and paying for flights to buying a few apples from a tiny market vendor with the app. WeChat has become so big that the word ‘app’ feels a bit too small to describe what it actually is. WeChat, recently hit one billion monthly active users worldwide. What started out as an instant messaging app in 2011 has revolutionized life in China and beyond. Before getting into what makes WeChat so popular and powerful, let me show you how omnipresent WeChat was during my business trip to Shanghai last month just to give you an idea of how integrated it has become people’s lives in China. I start my day by checking my Moments page to see what my friends and business partners have shared. I can react by giving a thumbs up and leaving comments below. Basically, this is similar to Facebook and Twitter, not really innovative but a standard feature for social media. On my way to work, I stop by a coffee shop to buy a cup of tea. The vendor invites me to subscribe to its WeChat official account to get a five percent discount. Ah, that’s a good deal. Then I simply tap on WeChat Pay and scan the vendor’s QR code. The transaction is done within seconds. This is extremely helpful as no one wants to count coins when she’s in a hurry. In the office, I open WeChat on my desktop to follow up with my team’s marketing strategy in our WeChat group. We share documents, visuals, and links. I also have a video conference using WeChat with a few clients who are based in Shenzhen and Guangzhou. It’s lunchtime and I order a food delivery through a mini program. Mini programs are specialized apps that are readily available within WeChat. Imagine having apps available with a simple search and a few clicks that do not require download time or space in your phone’s storage. Now imagine that they cater to almost any need you might have. They can also be dispensed with a swipe and don’t require and uninstalling process. That’s what mini programs are like. After that, I buy some snorkeling gear from a WeChat Store and book my flights to the Maldives. All tasks become a piece of cake with the aid of WeChat Pay. WeChat mini program of an ecommerce platform Mogujie. In the afternoon, I have a meeting near my office building. Instead of queuing for the bus, I choose to use the bike-sharing service, which can be found everywhere in the city. All I need to do is to open WeChat to scan the QR code on a bike and unlock it by paying through WeChat Pay. Easy peasy! After work, I use WeChat to hail a taxi back home. In the cab, I’m bored so I click on my subscribed official accounts to see all the latest updates on the accounts I follow. WeRun’s ranking page in WeChat. Anyway, my day with WeChat sounds cool, doesn’t it? WeChat seamlessly connects every aspect of my life in China and brings convenience. Let’s look into the distinctive functions of WeChat that make it stand out from other social platforms. In WeChat, you can send messages in text, voice message, pictures, or video in direct messages or group chats. You can also share your life updates in Moments and interact with your WeChat friends. In addition to the typical instant messaging and posting functions, WeChat is great for business communication. It’s commonly used in workplaces and has developed a number of features, such as easy file sharing and conference calling options to streamline workflow. Enterprise accounts, which is designed for intranet communication, are used for things like applying for leave, tracking projects, and submitting reimbursement forms. It’s also increasingly common for business people to scan each other’s WeChat QR codes instead of exchanging business cards. The enterprise account of China Eastern Airlines, with functions such as mobile office and crew scheduling. WeChat launched its own payment solution — WeChat Pay — in August 2013. It allows users to not only pay for online and offline purchases, but also to send money to peers. You can complete a payment by simply scanning a QR code, no matter you are in a chain store or with a street hawker. There’s even a “Go Dutch” function that makes it easier to pay for group activities such as team lunches. With the convenient digital wallet, many Chinese claimed that they feel comfortable even without any cash on them. Living a cashless lifestyle in China isn’t a dream, it’s actually quite easy. I’m not exaggerating, I was in China last month for 10 days and didn’t use any cash during that time, everywhere I went I had the option to pay with WeChat. The QR code for you to receive money through WeChat Pay (left) and payment transaction history (right). WeChat also has ‘official accounts’ which are somewhat similar to a Facebook page. They produce articles and cover news, stories, product reviews, and more. A variety of official accounts established by brands, media, or even individuals are available for you to subscribe to. You will then receive push notifications of their daily or weekly updates. With the improved search function, you can now search for any content related to keywords, such as articles published by official accounts, mini programs, content published by your friends in Moments, conversation history, etc. Chinese people love to do research on products they’re interested in, or find news on certain topics from the media, the public, and their friends — all within WeChat. With the constant and sufficient supply of information, WeChat becomes a touch point connecting people in China to the world. The official accounts you subscribe to and all their push messages. In January 2017, Tencent officially released its WeChat mini program platform. Mini programs are cloud-based embedded apps within WeChat which are simplified to retain their core functions. This means that you won’t have to install as many apps as you do now, and save some precious phone memory! Mini programs for services such as paying for shared bikes, hailing and paying for taxis, and paying electricity bills work smoothly within the app. For instance, you can make a hotel reservation without downloading the Expedia’s app. There’s another mini program that monitors battery usage of your smartphone. Once the battery is low, the mini program will automatically send a push notification and direct you to the closest location where power banks can be rented. These examples of WeChat connecting online and offline activities are just the tip of the iceberg. Mini programs in WeChat that allow you to purchase movie tickets (left) and make a hotel reservation (right). Combining all these aspects above makes WeChat hugely convenient to use and makes a WeChat user’s life much easier. The app did start with “copying” some functions from other market players, but it went way beyond and became a monolithic platform, embracing the functionalities of Whatsapp, Facebook, Venmo, ApplePay, Amazon, GooglePlay, Skype, Uber, Yelp, Expedia, and more. It’s interesting to see that WeChat has turned the tables and the West is now looking to be the copycat. 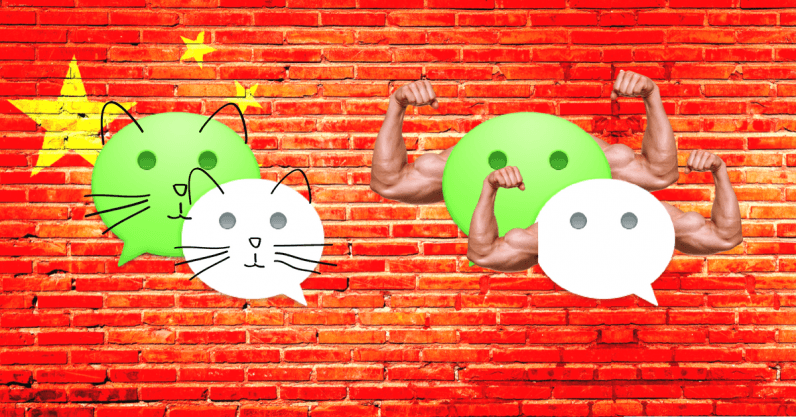 Plenty of foreign tech companies want to replicate the success of WeChat. For example, both Snapchat and Facebook have incorporated peer-to-peer payment functions — Snapchat teamed up with Square Cash to launch Snapcash in November 2014, while Facebook introduced the payment option in Facebook Messenger in March 2015. In the future, people may only need WeChat installed on their phone in China as users can do all their online activities within WeChat and without any other apps. While this is just an assumption, one thing is clear — WeChat is no longer a copycat. It’s a superb innovation that is reshaping lives.